The community is located south of the settlement of Almon, north of Road 437, which leads from A’nata to Hizmeh. 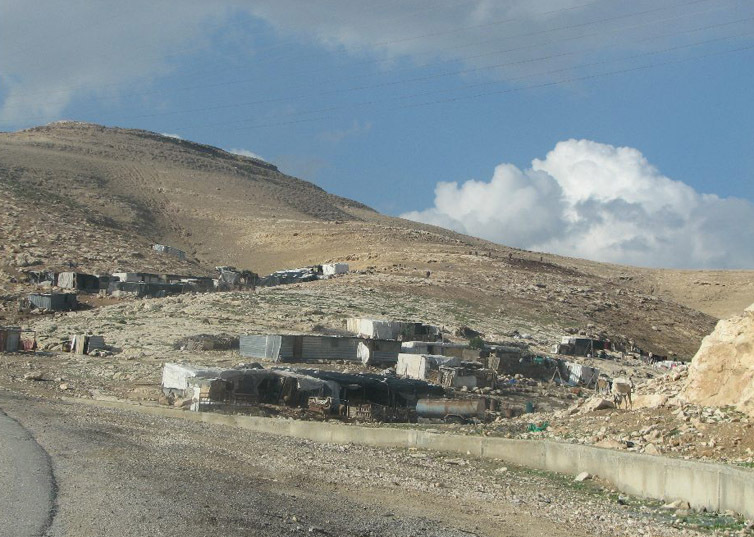 The community arrived there in 1948 from the area of Masafer Yatta, southeast of Hebron, where they own lands. For years, they migrated between the two areas, with the lands near Hebron serving for agriculture, and those in Nkheila used more for living, until eight years ago when they abandoned nomadic life and settled permanently at this location. Some of the locality is located on private lands owned by A’nata residents, and some on registered state lands. The locality is included in the jurisdictional realm of the Almon settlement, some of it within the plan limits of the settlement and some of it along the course of the planned road intended to connect Road No. 1 with Anatot Junction. Continuous building can be identified there since 1990. Residents’ houses are scattered along the hill slope, and come very close to the road. The demolition orders issued during 1990 were not implemented, but residents were prohibited from adding to existing houses or erecting new structures, and in 2012, again demolition orders were issued for houses there. In the past, one could access the E’in Fara spring in Wadi Qilt with flocks and the open grazing areas were more expansive. Today, residents can use only approximately 20% of the grazing area that was accessible in the past, and there is no access to water sources. Thus, today, the flocks are in pens most of the time, and only sometimes set out to graze in the immediate vicinity. Milk products serve mainly for home use, and the very little is marketed on a per-order basis. Next to the houses, residents cultivate very small gardens for home use. The very few residents who work outside are employed mainly in construction in the settlements; but only an even smaller number has proper permits. The unemployment rate among men is approximately 90%, and none of the women work outside the home. Sometimes, they receive assistance from the Palestinian Authority, mainly in the form of food for their flocks, but this is irregular and undependable. Although the locality is near the road, public transportation vehicles are forbidden to stop for passengers there, making it immensely difficult for residents to access the nearby localities. The sewage from the nearby settlements flows through the wadi on the other side of the road to the waste treatment facility, constituting a serious environmental hazard. 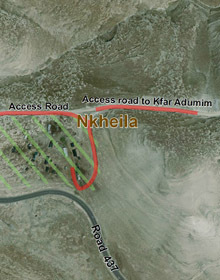 Residents at the site have to date rejected the various proposals suggested to them by the army – to move to the area of Nabi Musa or to Tabaq Qtef – and they are not prepared to accept any option that involves living in the locality with the Jahalin tribe or any solution on private lands owned by someone else. Alternately, they suggest the solution of moving to state-owned lands at the top of a mountain near Hizmeh, across from A’nata, in the area were another Bedouin tribe, belonging to the Ka’abnah tribe, resides. 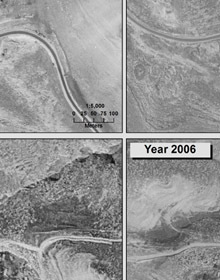 According to their claim, in 1981, a Bedouin family received this land from the state when the latter sought to remove them from another area, and they see nothing wrong with the state’s deciding to address their problems in a similar manner. In their opinion, this would be an ideal solution for all parties: they would move to an area suitable to them that is also acceptable to the Civil Administration, and in addition, they would be living with members of the Ka’abnah tribe. – Included within the jurisdictional and planning limits of the Almon settlement.